When a small piece of heart muscle tissue is needed for examination, a heart biopsy can be performed. 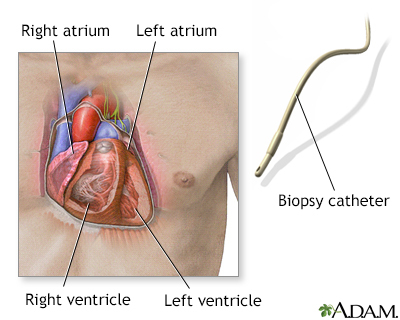 A catheter is carefully threaded into an artery or vein to gain access into the heart. A bioptome (catheter with jaws in its tip) is then introduced. Once the bioptome is in place, three to five small pieces of tissue from the heart muscle are removed. The test is performed routinely after heart transplantation to detect potential rejection. It may also be performed when cardiomyopathy, myocarditis, cardiac amyloidosis, or other disorders are suspected.